Can I really be thin? If you've ever asked these questions, and others like them, this site is for YOU. As you explore my site, you will realize that there are many people around the world, just like you, who are tired of being overweight and made the decision to stop the diet merry-go-round forever. You have tried all the diets and know that dieting does not work. With weight loss surgery, the weight will come off and more importantly, with your dedication, it will stay off. Being thin does not have to be just a dream. By using weight loss surgery as a tool to assist you, being thin is a reality, even if you are severely overweight. You will find a tremendous amount of information on this website that covers the RNY gastric bypass surgery as well as the Duodenal Switch, and Lap Band procedures. Come with me on a wonderful journey to discover a new you; a journey to release the thin person that is hidden inside you, desperately trying to get out. Weight loss surgery worked for me and it can work for you too. My surgery was almost 20 years ago and I have been able to keep most of my weight off. You can do this!! 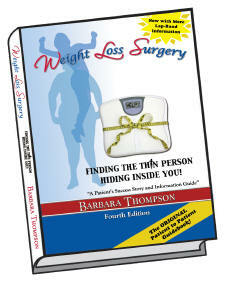 The book that answers ALL your questions about weight loss surgery from the patient's perspective. The patient guidebook recommended by leading surgeons and other healthcare professionals from all across the USA! "...a superb, comprehensive guide to weight loss surgery." The Obesity Action Coalition (OAC) is the ONLY non-profit organization whose sole focus is helping those affected by obesity. The OAC is a great place to turn if you are looking for more education as well as a way to get involved and give back to the cause of obesity. There are a variety of ways you can make a difference, but the first step is to become an OAC Member. The great thing about OAC Membership is that you can be as involved as you would like. Simply being a member contributes to the cause of obesity. This website is strictly for informational purposes, and in no way should it be used as a substitute for consultation with your medical doctor, surgeon or health care professional. The facts in this website are based upon the authors experience and research and do not imply that your experience will be the same. The host is providing you the information so that you will be better able to choose, at your own risk, whether to act upon that information. You should not consider educational material herein to be the practice of medicine or to replace consultation with a physician or other medical practitioner.